Each BounceU facility is an indoor, climate-controlled stadium filled with giant inflatable play structures, accompanied by additional play equipment and video arcade games. 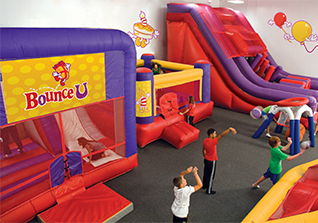 In addition to hosting birthday parties and other special occasions, BounceU stadiums also offer “open bounce” sessions to provide franchise owners with an additional revenue stream. We believe there is no bond greater than the one between parent and child – at BounceU, parents quickly become satisfied customers after they realize the happy memory they’ve just created with their child. 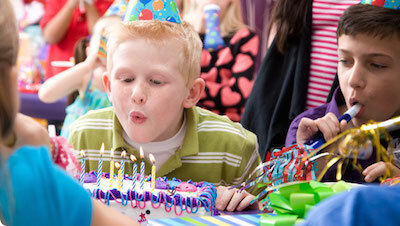 In today’s economic environment where parents are earning more, but have less free time, the dollar amounts being spent on birthday parties and other celebrations is increasing at an unprecedented rate. Busy, dual-income parents need a solution that is the most fun, without the hassles of cleaning up after 30 kids. The fact that the party is occurring at a BounceU and not at the customer’s home provides unbelievable peace of mind for the hosting parent. And, with BounceU’s highly trained “party pros” overseeing every event, parents can experience that coveted feeling of having created a happy memory with their child. The cost to parents to hold an event at BounceU is the same as if they had the event at their own home. If that’s not enough, they just have to envision the look on their child’s face at the end of the perfect party – at BounceU we truly do create happy memories for kids and parents. Training, Grand Opening Support and “The Recipe”: BounceU provides comprehensive training, both at our corporate offices and at your franchise location. We have an experienced pre-opening team to get you started on the right foot and to provide you with the peace of mind that comes from knowing you’re not alone.